At a recent get together with friends, we stopped for dinner at Famoso down in South Edmonton Commons after running errands in the area. With lots of natural light streaming in from the windows, the open kitchen ovens blasted out plenty of heat to compete with the restaurant's air conditioning. At this semi-cafeteria style pizza joint, you place your food and drink order, pick up your drinks (alcoholic or non), pay, and settle into a self seating dining area. Your food comes out as soon as they assemble it +/-baking. While waiting for some of our firends to arrive, we ordered a Flatbread appetizer. Their pizza dough is flattened and baked with extra virgin olive oil, fresh garlic, oregano and some crumbled creamy mild feta. Fluffy, slightly chewy, this pizza dough resembles a great naan bread. 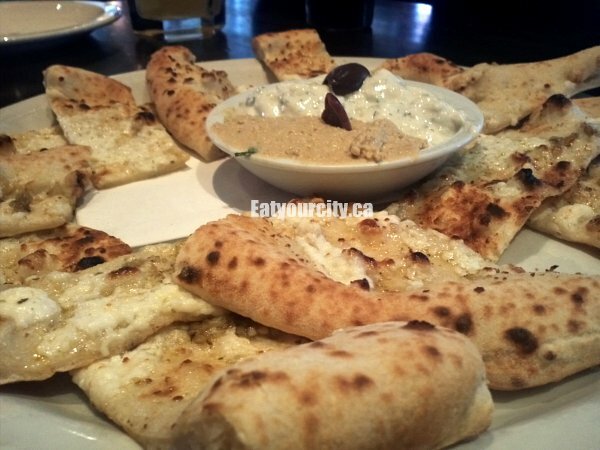 Fittingly, you get a small dipping bowl of house-made cool tangy tzatziki and a bit on the runny-side Tuscan hummus. Maybe it was the heat from the ovens. Cutting the slices of flatbread down into more manageable pieces instead of enormous strips would have made dunking easier. Mmmm. 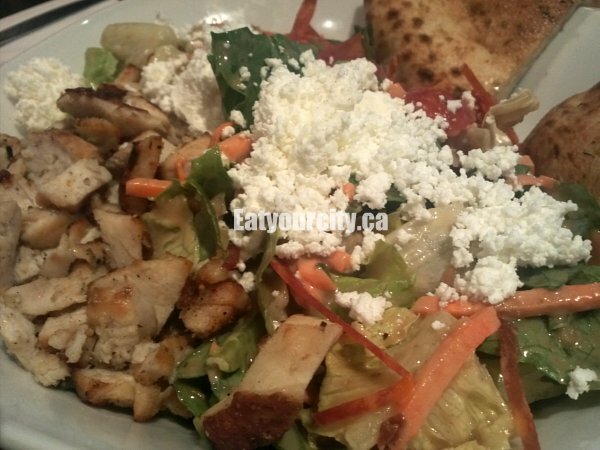 The Famoso Salad was next up. A sizable bowl of chopped romaine lettuce, prosciutto crisps, carrots, cherry tomatoes, spicy sopressata​, roast​ed chicken strips, feta, all drizzled with a tasty Dijon-bals​amic vinaigrette. Its only downfall... the salad was tossed in the dressing quite a while ago, so though the flavors worked really well, the salad came out quite soggy and limp. Dressing always always always goes on last minute! 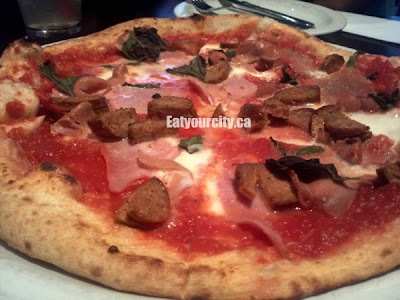 First out was a rosa pizza - the Siciliana, with the salty semi-lean Italian sausage chunks, and thin slices of Italian ham nicely balanced with the acid tomato sauce. Fresh basil leaves should have been added in after the pizza comes out of the oven as they turned a not too appetizing brown. Still, a tasty pizza. 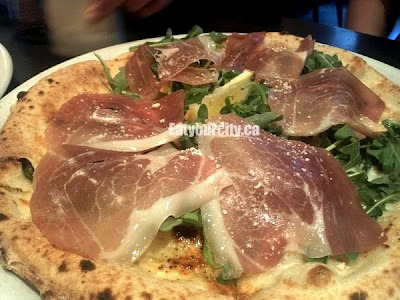 Prosciutto arugula was another one on their regular menu. This bianco pizza is baked with olive oil, garlic and cheese, then topped with arugula, prosciutto​, and pecorino romano. Super, simple and tasty. 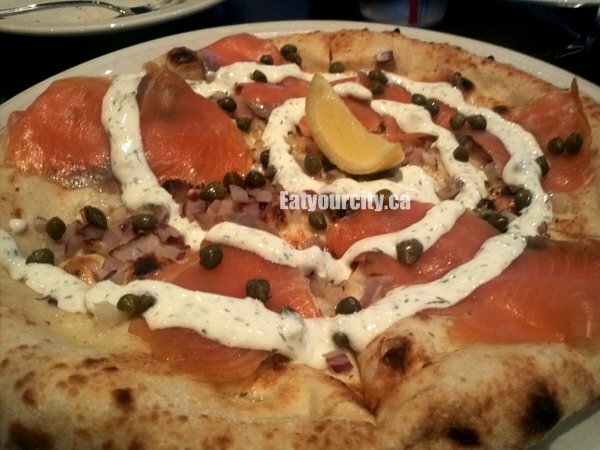 We also tried two of their spring/summer special pizzas. We hope they keep all their spring/summer specials year round as they're different from the usual, and most importantly... tasty! The first being the Smoked Salmon. The crust is slathered with extra virgin olive oil, minced garlic, oregano and diced red onion before being tossed in the oven Its then topped with thin slices of smoked Atlantic salmon, capers, a drizzle of dill cream sauce, and served with a lemon wedge (not needed). Its like a brekkie lox! 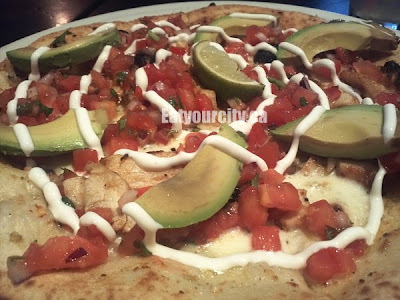 The second spring/summer special pizza we had was the San Andreas, my fav of the night. On the base is extra virgin olive oil, garlic, oregano, mozza cheese and chili-lime marinated chicken chunks. After baking, its topped with ripe creamy avocado slices, diced roma tomatoes, diced red onion, cilantro, drizzled with light creamy sauce (similar to the base used to make the tzatziki sauce) and served with an extraneous lime wedge. The pizza is wicked on its own. Nom! Overall, a good place to grab pizza with friends. Glad its franchising chains have worked out the kinks. No more hideously burned pizza crusts like our last visit when they first started churning out the franchises!